Watercolourist, wood engraver, lithographer and mural decorator, Ravilious was born in Acton but grew up in Eastbourne, Sussex, where he studied until receipt of a scholarship to the Royal College of Art. Student in the Design School of the College, Ravilious was taught by Paul Nash and became friends, and sometime work companion, with Edward Bawden. In 1930 he married the artist Tirzah Garwood and befriended Sussex based artist Peggy Angus. It is from her home, Furlongs, near Firle on the Sussex Downs just outside of Brighton, that Ravilious began to paint his Downland subjects. Ravilious went on to design for Wedgwood who, in 1937, brought out the George VI commemorative Coronation Mug, and in the same year the (much collected) Alphabet Mug and Nursery Ware designs. In 1938 Country Life published the book High Street, by J. M. Richards, for which Ravilious supplied a series of lithographs documenting the charms of certain Victorian high street shops – some no longer extant such as the Saddlers and Harness Maker’s shop, or the Fireworks Shop. 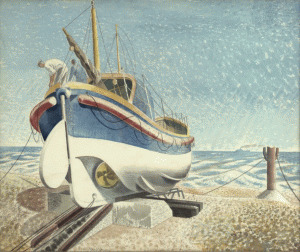 Ravilious was appointed Official War Artist in 1940. His watercolours during this period document the setting up of coastal defences at, amongst other places, Newhaven in Sussex; he also worked on a series of lithographs which record life as a submariner patrolling the Channel waters. In 1942, aged 39, Ravilious was posted to Iceland, and in September he participated in an air/sea rescue on board a Hudson plane in search of an aircraft that had disappeared on the previous day. The Hudson itself, however, was lost and Ravilious, along with four others, never returned from this mission. Ravilious is well known for his wood engravings and for his designs, but more recently it is his watercolours which have, perhaps, been of central interest. If artists are sometimes defined by their work on a particular area – Palmer by Shoreham, for instance – Ravilious, as Peyton Skipwith suggests, is the ‘artist par excellence of the South Downs’* Ravilious’s austerely beautiful watercolours are almost always devoid of people. But it is this very lack which Ravilious explores: so often in his paintings there is a conspicuousness of absence. There is evidence, almost always, of the land having been traversed and used: the paths are well trodden, the fences zigzag their way across the terrain and pieces of machinery lie rusting in the fields. These man-made artefacts are presences by association to the absent walker, farmer and machine operator; and the lack of actual presences can sometimes lend a certain sadness to the poignant beauty of the pictures.